I’m not sure if it’s because the two words start with the letter ‘F’ but Footys and Fun seem to go well together. Just pottering about should be fun of course, that goes without saying, but racing? 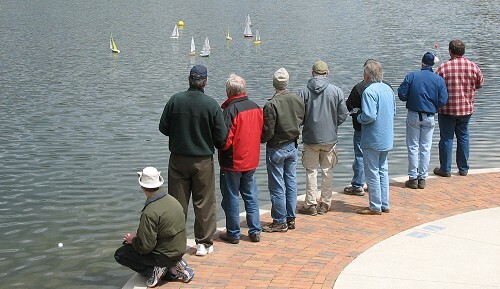 I have raced both Marbledeads and International One Metre model yachts and those classes can be fun but have a habit of getting very serious rather quickly! I raced the old ‘575’ yachts back in England too and yes without a doubt they were fun just like the footys. For me what makes the difference is the relaxed nature of the racing with regard to the rules. Now this doesn’t mean that the racing is a free for all or a barging binge, but it does mean that it is very rare that the racing is aggressive and verbal. Many footy sailers are complete newcomers to sailing in general and yet they do turn up at regattas and are openly welcomed and encouraged to have a go as best they can. Seeing experienced skippers and beginners racing together and getting along is very pleasing. Somehow the overall foolishness of racing these little tiny boats deflates the big egos and encourages the newbies… brilliant! Now anyone who has been following the recent Footy Rules ballot could be forgiven for thinking that this fun element wasn’t reflected in the debate. Well I think that is true but without a doubt the few volunteers we have who have taken on the task of administering the class are doing their best to mold the rules to reflect the wishes of the majority of the registered owners as seen in the ballot. There are those who don’t like the likely outcome but that’s democracy right? I voted against changing the battery rule but now that it looks like the rule will change I am excited about the possibilities that the change will open up. I suggest that we all get behind those officers who are trying to move the class forward and welcome the new rules openly when they are published very soon. We need the guys who are working so hard on this to survive the process and stay with us. Without Angus, John, Flavio, both Bills and others we could lose the energy and direction which has brought our new class so far so quickly. Tell them on the forums that the normally silent majority is behind them and accepting of the new rules. I am convinced that the Fun will remain in Footys and the rapid growth in races being organised will continue. We will be organising the ‘Sheboygan Footy Fest’ here again in May 2009 and hope to get another good turnout. In the USA Florida is packed with great racing being organised by a host of clubs. New Hampshire ran races this year and a group in Michigan is trying to get a start. If you are in a club with a few footys get some informal racing organised. It’s amazing how quickly the unbelievers change their minds about these small boats when they see what fun they can be around the course. Text and photos may not be reproduced without written permission from Graham McAllister Designs.